The order is the brainchild of a Frenchman who goes by the pseudonym Adama. He is both a Freemason and a Mormon convert and Sunday school teacher. In the independent Mormon magazine Sunstone, it is reported that the founder converted to Mormonism in 2005 and a year later started the Kolob Order after studying the Book of Abraham, an early Mormon scripture. 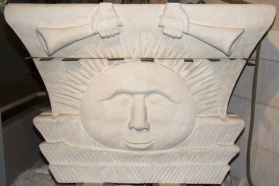 Scholars maintain that Freemasonry had a role in the early beginnings of Mormonism, especially since some of its new leaders and adherents were also Masons. But the paths between the two movements have rarely crossed since then. However, both Mormonism and some orders of Freemasonry give their members secret names– the reason for the pseudonym of Adama (as well as a way of avoiding publicity for the order). In France there are only 35,000 Mormons, while the membership of Masonic groups is significantly larger. There are two main divisions of Freemasons in France: “liberal” Masonic orders which do not require members to believe in God; and spiritualist, symbolist orders which do require this belief. Adama joined the liberal Grand Orient of France lodge when he was 21, but after studying esotericism he gravitated to the spiritualist Grande Lodge of France. It was while meditating on a hill in the Vexin region north of Paris that he felt inspired to write down his idea for the Kolob Order. Writer Chrystal Vanel notes that Adama’s mystical experience was similar to Quaker founder George Fox’s vision of souls coming to Christ on England’s Pendle Hill. The Kolob Order calls itself a symbolist and ritualist association with Mormon and Masonic inspirations. The members are a mix of Mormons and Freemasons as well as those interested in such occult movements as Rosicrucianism, Martinism and even UFOs. There are no official connections with either the Church of Jesus Christ of Latter Day Saints (Mormon) or any Masonic order. The order presents lectures and maintains an Internet presence (with a blog), covering such topics as the pyramids in Egypt as well as the symbolism of the Book of Abraham. The order has compared the pentacle found on the Mormon Nauvoo Temple in the US to the stars found on 18th century Masonic aprons. At its informal meetings at a restaurant in Paris, the order conducts an opening ritual that includes opening the Book of Abraham in silence to the third chapter and then lighting a candle to symbolize light and knowledge. Next to the Book of Abraham is a brick on which is carved “Nauvoo,” the Illinois city that stands both for Mormonism and Freemasonry. Members of the order dress in suits, white shirts and ties and long green Masonic collars. Vanel reports that Adama is planning more elaborate rituals for future formal meetings.